Experience our authentic hand-crafted Japanese Futon, with untreated, 100% natural white cotton traditional covers to protect them. Some photos show both shikibuton and kakebuton, but only the shikibuton is purchased in this transaction. SKU: N/A. Availability: In stock Available in: N/A Shipping Weight: 10 kg Category: Futon Shikibuton. Tags: futon, futons, japan, japanses, shikibuton. 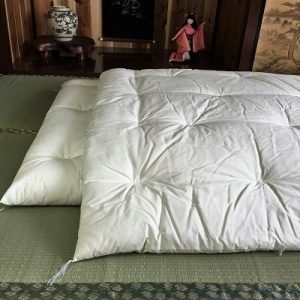 • Highest Quality Available: Our 100% authentic Japanese futon are hand-made in the traditional way by true futon Masters in a small family-owned business in Kochi, Japan. • Lightweight, Compact and Easy to Store: Our traditional Japanese futon contain natural cotton filling and no heavy, bulky polyurethane foam pads. • A Much Healthier Choice: Because our authentic futon contain no polyurethane pads which trap moisture and become incubators for mold/mildew, they are a much healthier choice than inferior Western style futon constructed of synthetics. • 5 to 7 Years* of Total Comfort and Convenience: Futon provide amazing comfort while supporting your back. Our futon have NO polyurethane foam pads or soft-coil springs which quickly compress and get lumpy & uncomfortable. “We are currently in a small room, and a futon that folds up nicely is great for space. Love it! It is like being in Japan. 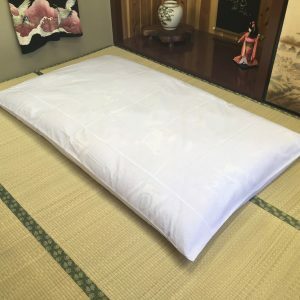 So happy that there is this service to get a real futon from Japan — thank you! I would recommend this way of sleeping to everyone!” – Josie B.